by Gerald Jampolsky, M.D. 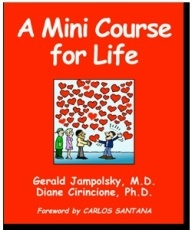 and Diane Cirincione, Ph.D.
NOW: Save 40% off the retail price of $14.95! A Mini Course for Life offers you new choices for dealing with old challenges and presents amazingly adaptable lessons for solving problems and for whatever life sends your way. The selected concepts within the Mini Course are tried and tested and have been used with great success for more than 40 years. They work on many levels from deeply personal to interpersonal and from situational to global. At all levels this course provides a profound new way of looking at the world. "I can recommend A Mini Course for Life because I have experienced the lessons in this small book myself and found them life changing."